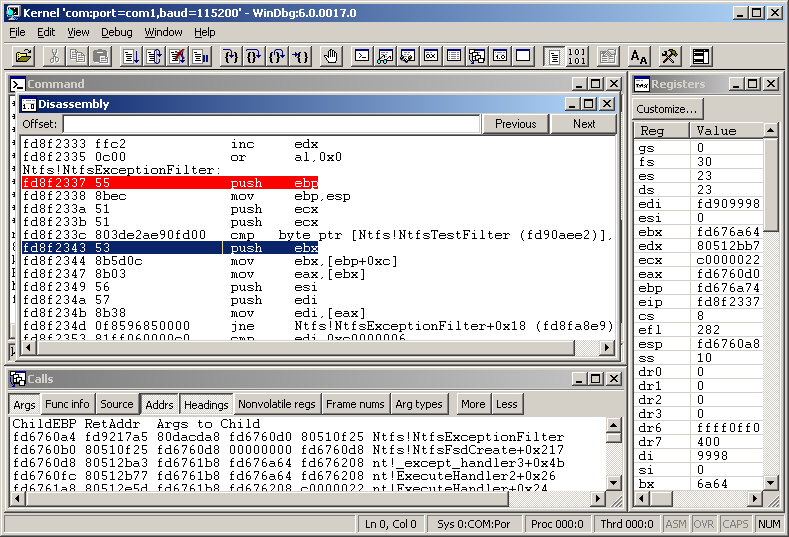 WinDbg is a graphical debugger from Microsoft. It is actually just one component of the Debugging Tools for Windows package, which also includes the KD, CDB, and NTSD debuggers. Its claim to fame is debugging memory dumps produced after a crash. It can even debug in kernel mode. For downloads and more information. This contains the 32-bit and 64-bit MSI's for Debugging Tools for Windows 6.12.2.633. This is the current version of Debugging Tools for Windows 6.12.2.633 and is available in the Windows SDK from http://www.microsoft.com/whdc/DevTools/Debugging/default.mspx. This release of Debugging Tools for Windows contains many bug fixes and new enhancements. The debuggers are stable and more reliable than previous releases and we recommend that you upgrade to this version. • Bug Check 0x9F Update – Added logic to diagnose bugcheck 0x9F minidumps using new data in Windows 7 added to the 0x9F minidumps by the Kernel and Networking Teams. • BugCheck 0xFE Update - Add logic to diagnose bugcheck 0xFE minidumps using new to Windows 7 callback data added by the USB team. 3. Fixed user-mode minidump generation problem. 4. Fixed buffer overrun in schannel transport. 5. Fixed several kernel debugger transport issues. 6. Fixed problem with debugger reporting incorrect FPO information. 7. Allowed stack dumps deeper than 65535 if specified explicitly. 8. Changed ".outmask /a" and ".outmask /d" to be set only instead of or/xor. 9. The old ADPlus.vbs is being replaced by ADPlus.exe which requires the .Net Framework 2.0. For those cases where the .Net Framework isn't available we are still shipping the older version renamed to adplus_old.vbs. For detailed documentation of the new ADPlus.exe as well as for its new companion ADPlusManager.exe please see adplus.doc located in the same folder as adplus.exe.